Are you looking to start a business, or grow one into exactly what you want it to be? That's awesome. Entrepreneurship is an exciting pursuit, but it's also a bit terrifying. This article will help with that - it's here to give you a bit of guidance as you get going. We've assembled a comprehensive list of the tools we've used in the past few years to grow our startup as well as some of their primary competitors. Along the way you'll also learn a few things about what to prioritize, what to put by the wayside, and how other top businesses grew their brands. I'll also link to some of my favorite entrepreneurship resources. Let's get rolling with building your business! Step one: you need a website. You can't do anything without it, so don't even try to start. You need a domain name and you need a framework to go on it. It's likely you already have this, so I won't badger you on this for too long, but if you're really starting from scratch then let's go tabla rasa - get a domain name and then put something on it. LeanDomainSearch - A leading domain name generator. GoDaddy - The top domain-purchasing site. Wordpress - The #1 platform for website creation. Thousands of free and paid themes make it easy to customize your website. Wordpress plugins allow you to add elements as you go. Shopify - Looking to sell online? Shopify is the primary framework used by ecommerce retailers of all kinds. Wishpond Landing Pages - Even if you use Wordpress, it's likely you'll have paid a web developer to create your website, and they'll have done a great job. The challenge, then, is keeping that website up to date. After all, you don't want to rehire that developer every time you have a new marketing campaign. And that's where Wishpond comes in. You can create the campaign pages yourself without needing a designer, developer or coder by using a template. You then embed that page's code (just drag and drop the code we give you) into a new page in your site's back end. Wix - Beautiful themes and templates built with your specific industry in mind. Lemonstand - A great, cloud e-commerce site framework (and they're Vancouver-based!). Alright, you have a website. You're ready to start receiveing visitors. Ahh, yes. Driving traffic to your website. That's a pretty crucial part of a successful online business, wouldn't you say? Google Ads - Often referred to as "CPC" (though that's actually an umbrella term), Google Ads primarily include those search ads you see at the top of your Google search and those display ads you see on the sidebar of your favorite news site. Social Media Ads - Predominantly including Facebook Ads, Instagram Ads and Linkedin Ads, these are your alternative to Google. Cheaper per click than Google, they're focused entirely on whatever audience you choose to target (instead of what keyword people searched). Google Alerts - Google Alerts make it easier to keep track of the outlets that feature your company as well as any key phrases (competitors, perhaps?) mentioned online. Cision - Helps your business identify journalists and reporters interested in your industry. StumbleUpon - A content amalgamator. Sign up (free) and submit your content to be found and shared by other users. Scoop.it - Similar to Stumbleupon, users create a "scoop.it" account and can upload their content based on different keywords, where it can be found by other Scoopers. Business2Community - Manually submit your articles (or set up an automatic RSS feed-type deal) and have your content republished on the very popular B2C website. For more on syndication, check out "6 Places to Syndicate your Content." For more on how you can drive website traffic, check out "How to Drive Traffic to your Website." Once your website is set up and collecting traffic from ads and PR, your next step is to establish and develop your presence on social media. Depending on your business, the amount of energy you'll find rewarded on social media will differ. For some businesses, particularly retailers and ecommerce, there's a lot of potential on social media. For B2B and SaaS, social media is often more a place to develop your brand, communicate a certain associated lifestyle, and drive awareness. Wishpond Social Promotions - The easiest way to drive new social media followers and engagement is through a social promotion - incentivizing your target market to engage with your brand online by offering a chance to win a prize. Wishpond's promotion and giveaway apps make it super simple with pre-designed templates and codeless design. Buffer - Buffer's our stand-in tool for every great social media management platform out there. These tools allow you to schedule and publish to all your social media accounts from one dashboard. 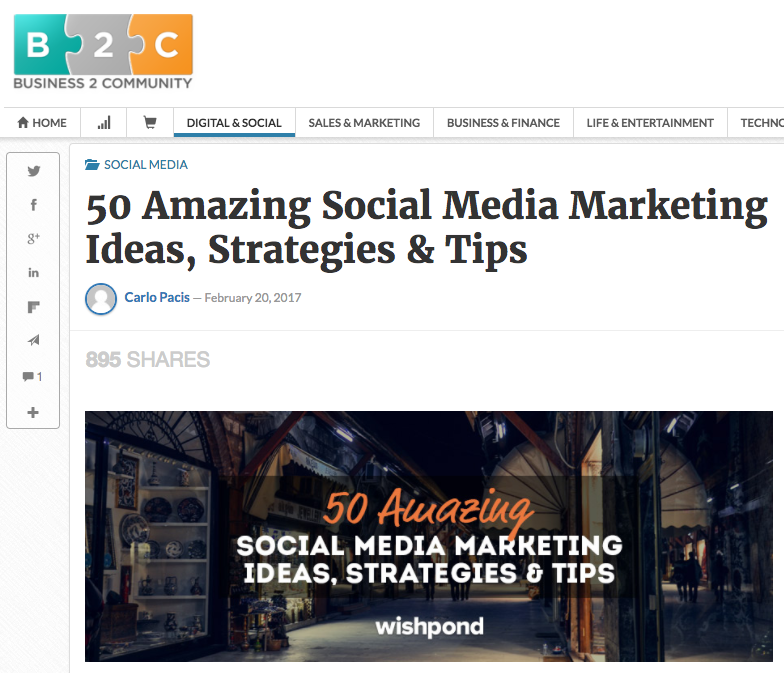 Several of these tools (including another favorite, Postplanner) also help you to discover the right kind of content to best engage your target audience on social media. SocialBakers - A leading social analytics tool. Sproutsocial, Hootsuite and Postplanner - The top social media management tools. Shop around! For a complete guide to starting on social media, check out my article "Social Media Marketing Plan: An 11-Step Template"
For more on social media marketing tools, check out "199 Social Media and Content Marketing Tools"
Okay. We've established a social presence and an online presence and we're driving a bit of paid and PR-based traffic. What's next? You need to start creating content and blogging. Content adds heft to your business' online presence. Without a blog you're nothing more than a whisper within the massive, complex world of the internet. With it, your voice gets louder and louder. 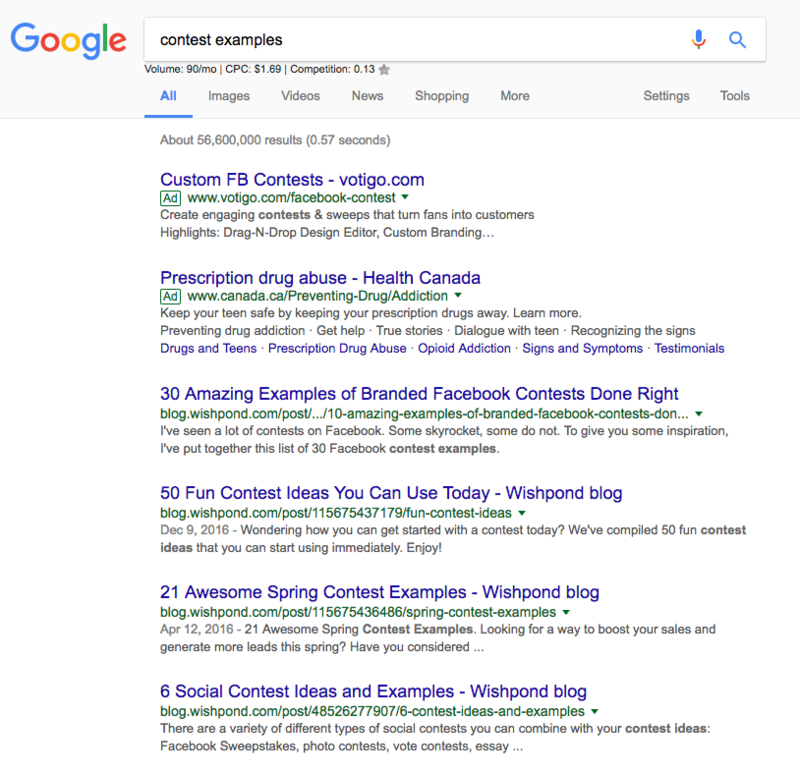 Content allows you to start ranking, organically, for search terms related to your business. This makes it easier for your prospective customers to find you. Content develops your business' place as a player in your industry. Your reputation increases; people start hearing about you and trusting what you say. Google Search Console - Google Search Console (part of the Google Analytics suite) makes it easy for your business to see how people are currently finding your website, what they're searching for, and how you can do more of whatever it is that's working (and stop doing what's not). Long Tail Pro - Long Tail Pro’s software enables SEO beginners to discover the best, most profitable, keywords and calculate Keyword Competitiveness for almost any niche. Google Docs - Google Docs stands out for content creators because of its collaborative abilities, revision saving and cloud basis - enabling multiple marketers to work on the same piece of content no matter where they are in the world. BuzzSumo - BuzzSumo helps content marketers identify what content is working best for their competitors. Grammarly - We all need an editor in our corner (even if we already have one, another doesn't hurt). Grammarly is a web app and a browser extension that monitors the grammar and spelling of anything you write in your browser. Feedly - A site allowing you to collate all the content of your competitors and the brands you love to read. A place to inspire your own strategy and keep up to date on everything happening in your industry. Moz - Industry-leading SEO software (though a bit more expensive than LongTail Pro), offering unparalleled analytics of your current SEO strategy and a data-driven approach. For more content marketing tools, check out "77 Tremendous Tools to Make You a Content Marketing Superstar." For more on content marketing strategy, check out "How to Build a More Complete Content Marketing Strategy." To get the most out of your ad budget, content marketing expenses and all the other money and time you're laying down to drive people to your site, you need to be sure you're doing as much as you can to drive a paid conversion. Some of this is about website optimization, or Conversion Rate Optimization (CRO). And some of it is about the strategies which can help your business engage with the people who visit your site but don't convert on it. Wishpond Website Popups - No matter how you feel about popups on other people's sites, the fact of the matter is that they work. An exit popup with relevant messaging and a desirable offer can reduce your website's bounce rate considerably. An entry popup notifying e-commerce visitors about a coupon code or limited-time sale can increase checkout rates. A scroll popup on your blog, reminding people they can subscribe to your newsletter and receive valuable information before anyone else, is one of the most powerful strategies for list-building. And click popups? Well, click popups are just about my favorite marketing strategy out there. And all of them are becoming an essential part of website optimization. Hotjar - Hotjar enables you to trigger polls (asking people for feedback) as well as funnel tracking, heat maps, session recordings and more. This gives you insight into how you can redesign your site based on the behavior of your visitors. Is nobody clicking on your "Start Free Trial" button because they don't want to? Or because they don't see it? Optimizely - Optimizely is the #1 A/B testing tool, and the one we use ourselves. It enables your business to send half of your website traffic to a "control" or original iteration of a page and half to a new design you think will convert visitors better. Adespresso Retargeting - The fact of the matter is that a huge proportion of your website visitors are going to bounce no matter what you do. Before retargeting, they were lost. With it, your site visitors leave with a cookie attached to their browser. This enables you to show advertisements specifically to them, driving them back to your site to complete whatever conversion funnel they left. CrazyEgg - CrazyEgg is the scroll-mapping, click-tracking tool used by many businesses to track how people are engaging on their website. PerfectAudience - A well-regarded competitor to Adespresso. For more on using my favorite marketing tool (click popups) intelligently, check out my article "How We Doubled Blog Lead Generation with Click Popups." Alright. We've come a long way, and invested a lot of our time and resources to getting our site up and running, visitors showing up and going away as rarely as possible. So what's our energy got us? As yet, we don't know. And that's like driving in a snowstorm with oven mitts on you hands. Unless you know where you're going, where you're coming from and what's working for you, you'll quickly end up in a tree. Yep, I'm talking about analytics. Google Analytics - GA is the essential tool for determining everything from your website and page traffic to your advertising ROI. It's the tool every digital marketer uses and, fortunately, also has the most comprehensive (and free) training courses to ensure you understand exactly how it works. Woopra - Woopra is, far more than GA, a funnel-based analytic platform. For instance, it allows you to track the number of people who view your homepage, then product page, then signup page, then checkout page - giving a clear depiction of how well your site is optimized from beginning to end. Pingdom - Pingdom focuses on giving you data about your website's uptime, performance, and transaction processes. Open Web Analytics - This open source web analytics software makes it easy to track and analyze how people use your websites and applications. Tableau - Tableau works with Google Analytics data to provide more insight than you can get with the base tool. It also makes it easier to combine GA with other pieces of software you use (like Salesforce). Building a successful business is as much about your ability to hire awesome people and get them to work well together as it is about the tools you use, the way you market your product or your ability to deliver. You might think that you can do it all with email and face-to-face meetings, but why work harder when you can work smarter? This being the modern era of business, there are better tools that can help you maximize your team's time, keep them connected and keep them happy. After all, a happy team is a productive team which sticks with your growing business. Let's examine some top tools which help you manage team projects, send campaigns for review, organize to-do lists, communicate and maximize workplace happiness. Trello - Trello enables your team to set up to-do lists, coordinate projects and manage campaigns from beginning to end. It's a must-have for any modern growth or sales team. Slack - Slack is the leading inter-office communication platform used by businesses to send messages, files and video-conference. Jostle - Jostle is a communications platform. It’s got a chat tool like Slack, but it’s also got a bunch of other features. People can post news and blog articles or share company-wide updates in a live feed. It enables teams to have all the communication benefits, alongside an emphasis on employee engagement not seen anywhere else. Asana - Asana is a leading Trello competitor and the tool used by our marketing and sales teams to manage projects, campaigns and client work. Email marketing is still the #1 way to communicate with prospective and existing customers. You're going to get a better view and read rate than you possibly can with social media and it feels far less invasive than a phone call (even if you can get a number). There are two crucial components of email marketing your new business: Newsletter (encompassing your mailouts to existing customers and blog subscribers) and Email Automation (encompassing your auto-response emails when someone buys and those emails you send to incentivize leads/contacts to become customers). Let's take a quick look at some tools which do a bit of both. Mailchimp - If you're just getting started with email, Mailchimp is the way to go. Their free platform enables young businesses to manage newsletters, email templates, early-stage list-building and segmentation and some auto-response stuff. 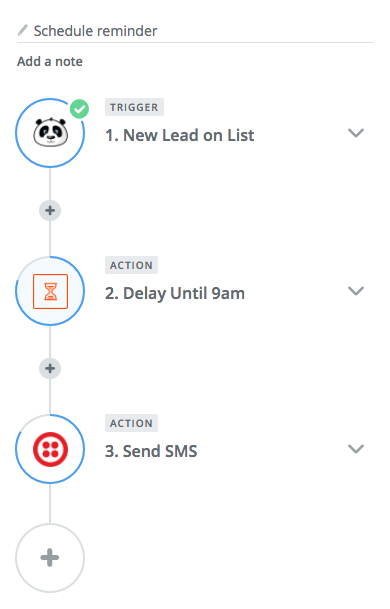 Aweber - Aweber's focus is more on email automation than is Mailchimp's, which is great for businesses who know what they're doing but don't have the money for a full-strength marketing automation suite quite yet. Wishpond Email Marketing - Wishpond's email marketing tools make it easy to send simple newsletters as well as automate your auto-responses, send internal emails to sales and create email drip campaigns to turn your prospective customers and leads into sales. If you're interested in diving into email marketing, you might find our resource, "19 Proven Email Marketing Templates We Use to Sell, Nurture, Onboard, and Reach Out" to be valuable. Once you start generating sales, you need to manage every stage of their experience. You need to be tracking where they came from, who they are, what their "touchpoints" were within your website and sales funnel, which sales associate they spoke to, the value of their purchase, and more. It's a lot of information, and, to determine your return from each and maximize the chance of them selling again, you need to do it for everybody. This is one of those "Wow I hope there's a tool to help me with that," moments. And of course there are. They're called Customer Relationship Management tools. And if you've ever heard of Salesforce but not totally understood what they do? Well now you know. Let's take a look at Salesforce as well as their leading competitors…. Salesforce - Salesforce is the leading CRM software out there, and for good reason. Their system does absolutely everything you could possibly need it to when it comes to organizing your prospective and existing customers, keeping track of their transactions, recurring revenue and more. Thousands of businesses consider it well worth the price. Pipedrive - Pipedrive is the CRM platform we use. It's simpler than Salesforce and offers all the tools we need. It's a great example of a general truth about choosing the right tool for your business: it's often worth considering a brand that's a little lesser-known. They have more to prove and, as they're up-and-coming, will often deliver more bang for the buck. Imagine your online business like a basketball team. Now imagine all these tools are the players. Only when they're working together can you get anything done. Without connectivity, whether through integrations or the tools I list below, your Center might pass to your point guard but and hit him in the face because wasn't looking. Unless my campaign page is connected to my email platform, what's the point in me getting a single subscriber? I can't do anything with them. Unless your marketing team can "tell" your sales guys that someone wants a VIP demo (without having to walk over with a post-it note), they'll never know, and that prospective customer will slip through the cracks. Let's take a quick look at a couple great tools which connect your software and tools together, ensuring they can see each other. Segment - Segment offers more than 180 single-direction integrations, meaning your online business can send data quickly and easily to software without having to integrate directly (Segment already is). This can be a lifesaver for early-stage businesses who need to, for instance, connect a transaction with an attribution tool. 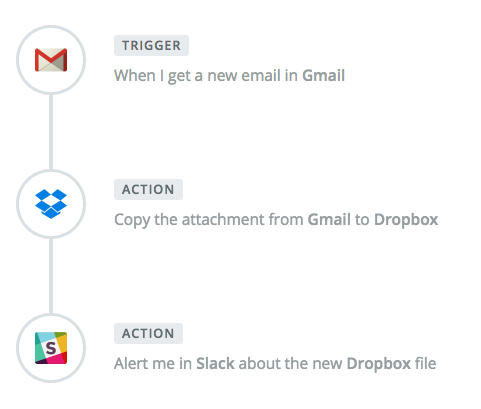 Zapier - Zapier is the big daddy of "tools that connect your tools." With more than 750 integrations (including almost every one of the tools in this resource), Zapier is an incredibly powerful platform. It allows businesses like yours to connect one side of your marketing strategy with another, without hours of expensive coding. Now that you've got all the tools you need to build a business, there's nothing left but to get those tools that save us as much time and energy as possible in any given day. These will cover both the tools which help you get more done as well as the tools which make the complicated easier. Upwork or Fiverr - Don't have a graphic designer in-house? Hire a freelancer in minutes through Upwork or Fiverr. The same goes for content creators, translators, web developers, and any other short-term contract need you have. These tools can save you serious time and money, and allow you to focus on doing what you need to to grow your business (rather than trying to learn Ruby on Rails while you should be sleeping). Canva - If you do want to dive into visual content creation, Canva will give you a solid leg-up. Templates, easy image editing and hundreds of icons, graphics and font choices make visual content-making simple. Lastpass - With all these tools, remembering their logins and passwords can be impossible. Use Lastpass to share login details with yourself and your team. All you need is to remember a single "Master" password and you'll stay secure. Nimbus Screenshot - If you're creating content, whether blog articles or case studies, you'll need a reliable screenshotting tool, and (for me) Nimbus is that tool. It enables section screenshotting and scroll screenshotting as well as some really handy image editing. Keyword Everywhere - To quickly and easily determine the search volume for any given keyword, just type it into Google. If you have the Keyword Everywhere plugin, you'll see the volume, CPC and competition right beneath the search results. Colorzilla - Any designer or content creator will love Colorzilla for its ability to quickly and easily grab the hex code of any color within your browser. Colorzilla stores all your "dropped" colors and makes it easy to keep your designs on-brand and visually awesome. For 11 more awesome Chrome plugins, check out "17 Chrome Apps Every Digital Marketer Needs to See." Social Media Management Software - A great SMM tool will save you hours of time with scheduling and analyzing your social media profiles. Email Automation Software - There is nothing more time-consuming than writing a hundred emails to your prospective customers. Use marketing and email automation tool instead to create the illusion of personalized email without the time involved. Hopefully this resource will help your new business achieve its goals. These are the tools that have helped us grow our business, and without them we'd still be crammed into a tiny room on the 9th floor, drinking Red Bull like it was water and waiting for the other shoe to drop. With help, hard work, a bit of luck, your business can find success online. And remember, we're here to help you get there! Don't hesitate to reach out in the comment section below.